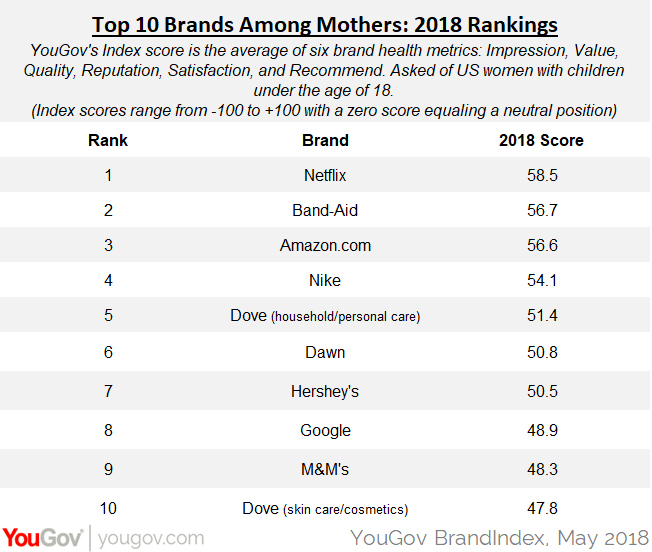 Netflix climbed from third place to the top position in perception research firm YouGov BrandIndex's annual mothers’ ranking of brand health. Even more impressive about Netflix is that it just debuted in the top 10 last year. This year, Netflix swapped places with Amazon, with second place Band-Aid remaining just where it was last year. Netflix is known for its female-centric original programming, including Unbreakable Kimmy Schmidt, Jessica Jones, Grace and Frankie, and GLOW. Two of Dove’s product lines – personal care (deodorants, shampoo) and skin care – appear on the chart for the first time in the fifth and 10th positions. Dove has been an award-winning marketing powerhouse based on its long-running “real beauty” campaign. What makes this victory even more impressive is that Dove clearly overcame its fall 2017 racial controversy involving an ad that showed a black woman turning into a white one. Chocolate has a bigger presence in 2018: last year, M&Ms replaced Hershey’s on the Top 10 chart – now they are both on it, in the numbers seven and nine spots. Of the new entries, Uber made the biggest jump with mothers, perhaps based on the convenience factor shuttling back and forth to activities. 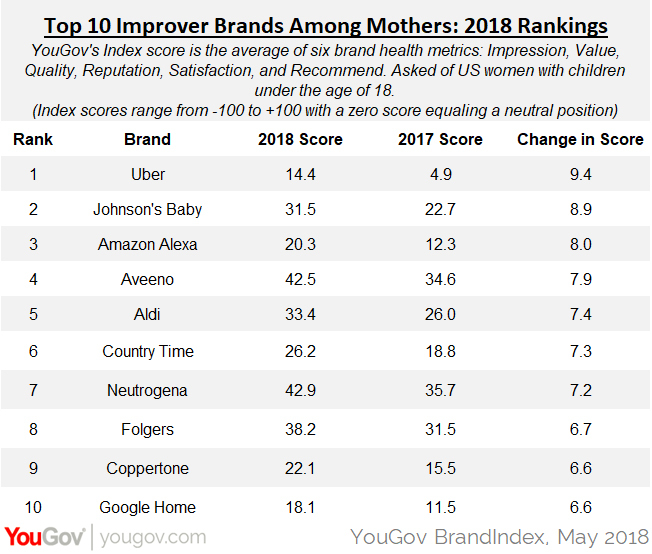 Also of note is the appearance of German-owned grocery store chain Aldi, which has been aggressively opening up stores across the U.S.
YouGov BrandIndex filtered its entire 1,600+ brand universe for women with children under 18 years old. The brands were then ranked using its flagship Index score, which measures brand health by averaging sub-scores on Quality, Satisfaction, Impression, Value, Reputation and willingness to Recommend. The Index score can range from 100 to -100 with a zero score equaling a neutral position.